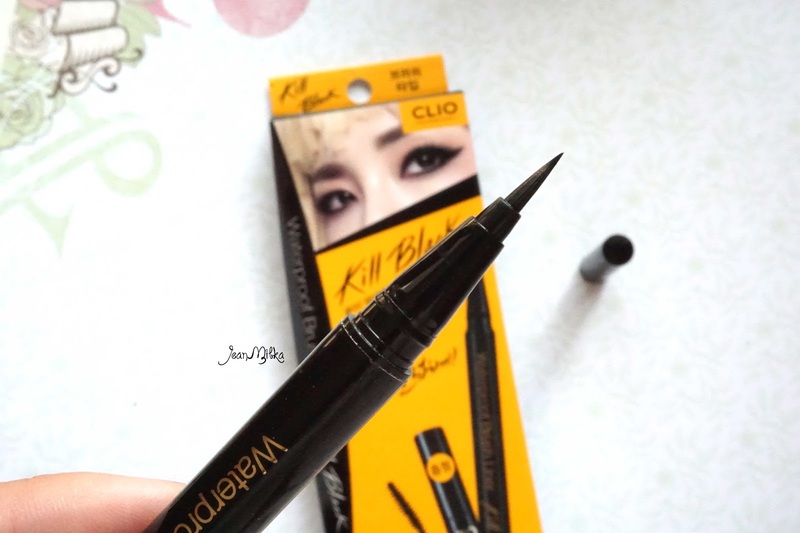 Today I want to review one of my favorite brush tip eyeliner which is Clio Kill Black. I got mine from Sasa *a drugstore that sells mostly asian beauty product* at Plaza Singapore. I can't remember exactly how much it was, but it's about 12 SGD (about 120.000 IDR). I am not sure if they sell it separately, but mine comes with the free O'Tank Mascara in a box. This is the first Clio product that I have ever tried. If you don't know, Clio is a brand from Korea with a huge makeup collection to choose. I never heard skincare product from this particular brand before. 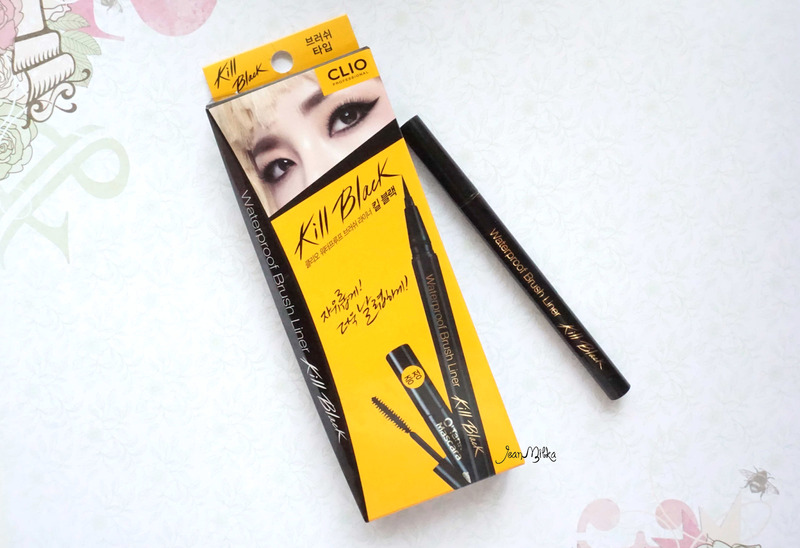 Clio Kill Black brush liner is one of the most popular product from them. 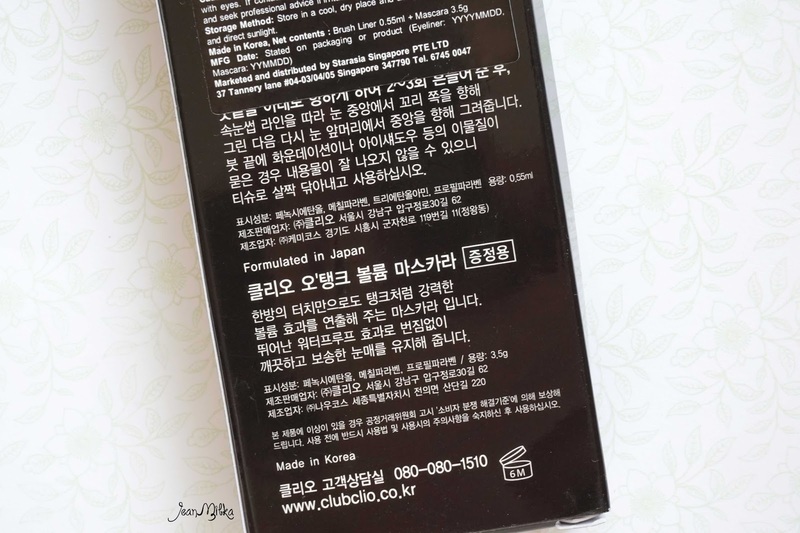 This is also one of the most mention product by Korean or Japanese beauty gurus that I followed. I have been a liquid eyeliner user for decade *definitely I am just being exaggerated hahaha... ^^*. Well what I want to say is that I have been using liquid eyeliner since the first time I did makeup. I don't like pencil type of eyeliner, and only using precision felt tip eyeliner marker. So, when it comes to liquid eyeliner, you can take my opinion to your consideration. I tried a lot of different liquid eyeliner, but I only reviewed some of my favorites. There is nothing special about the packaging, just a simple common black pen with the product name written in gold ink. The size of the brush tip is about 0,5 mm. It's actually not too thin, not too thick. The brush size is slightly thicker Dolly Wink Liquid Eyeliner, but thinner than Stilla Stay All Day Liquid Eyeliner. The brush size is a perfect size if you want to draw thin precise stroke. But if you have slanted asian eyes like mine, then 0,5 mm liners won't be enough to make your eyes look bigger. 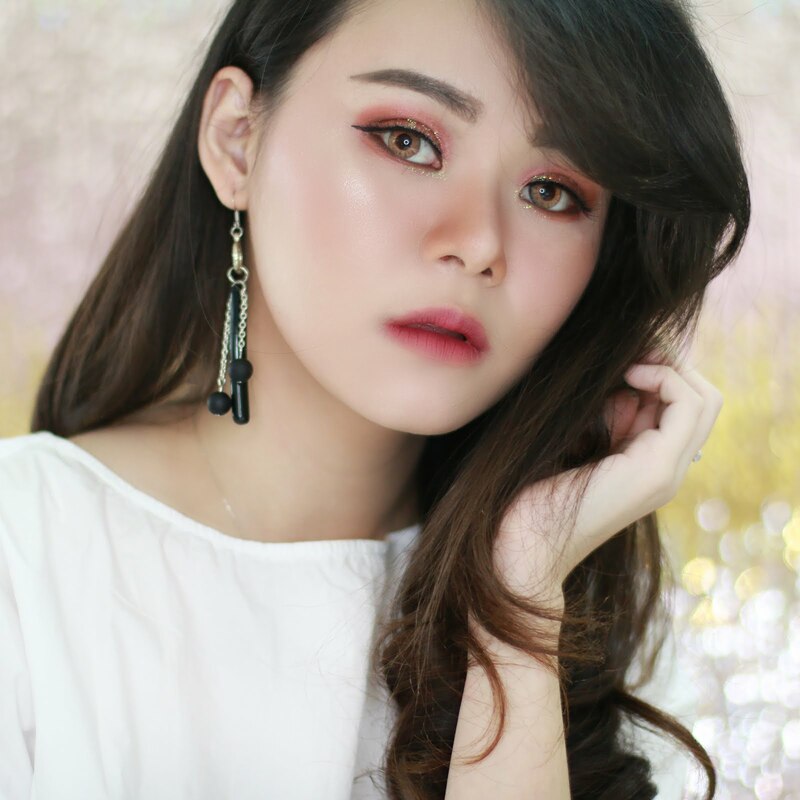 This is a perfect eyeliner pen for everyday natural makeup, but if you prefer smokey-eyes look with thick liner than you might like The Stilla All Day Liquid Eyeliner more. 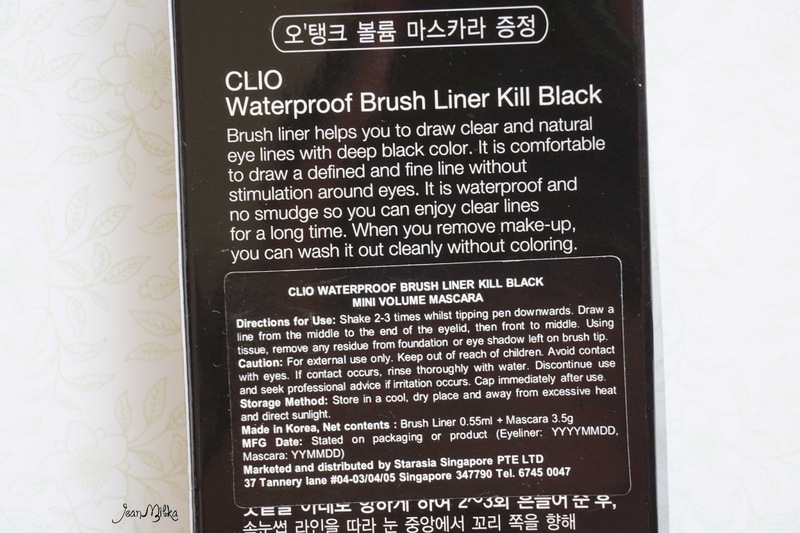 You'll need to apply more than a couple of strokes when using Clio Kill black to obtained fairly thick liner. I personally prefer the 1 mm brush tip eyeliner. Even though the brush tip size is quite thin, you still have enough control to draw any eyeliner shape that you want. 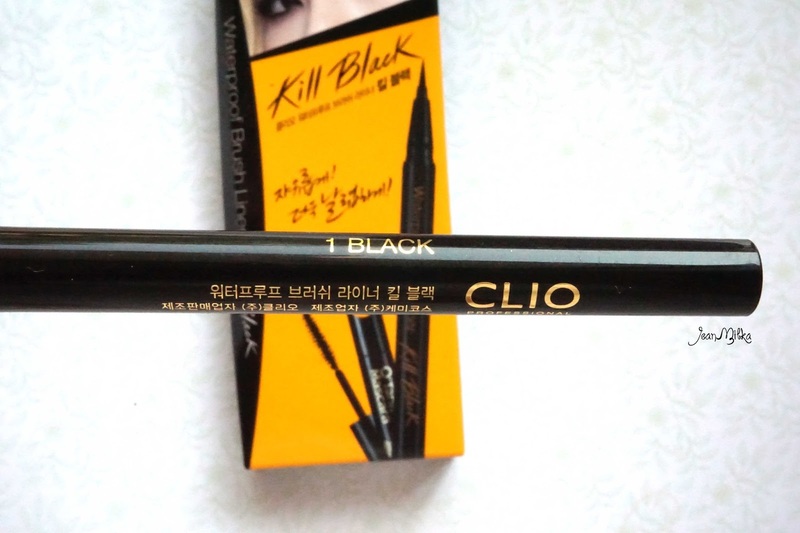 I tried some of Korean or Japanese liquid eyeliner with same brush tip size as Clio Kill Black or thinner. Most of the times, it's quite difficult to draw steady stroke since the tip is really thin. But I didn't suffered the same problem with this eyeliner. 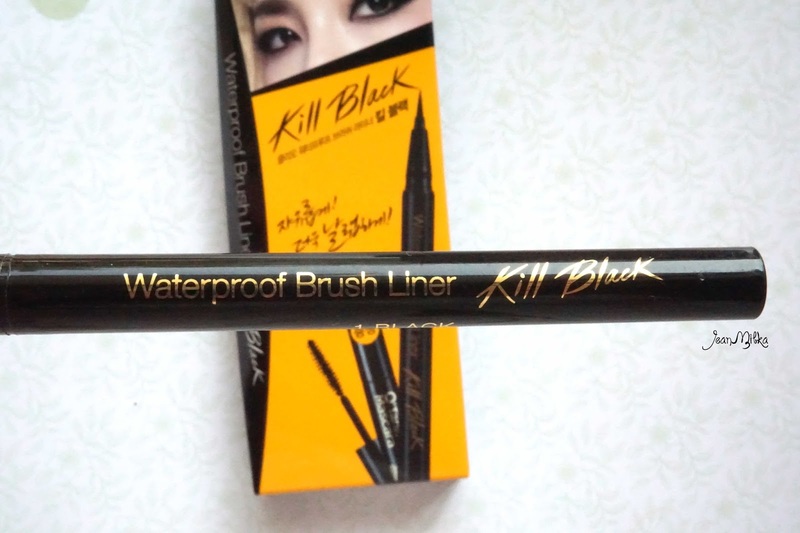 If I am not mistaken, the name "Kill Black" signifies the color of the eyeliner itself. The brown shade from this same line called "Kill Brown". On the box Clio claims this eyeliner is waterproof, smudge proof, and won't leave any residue if you wash it out cleanly. All this statement is proved true *by my experience*. I can go with it for a day and it won't smudge at all. As you can see from this picture below, right picture was taken after I rub my hand really harsh, which is something you won't do to your eyes. Also even after I rub it, It's fade out with out leaving any smudge. Which means it won't cause raccoon eyes. Otherwise, you will only need your basic eye makeup remover to wash it. Another plus point is the fact that the color is super black without noticeable glitters. 10 komentar on "Review and Swatch Clio Kill Black Waterproof Eyeliner"
It's really amazing how it faded after rubbing but doesn't smudge. I hate racoon eyes! Been wanting to try thisssssssss since forever! Not exactly an eyeliner type of girl but I guess it's really time to find it somewhere and try it myself :p Uda keburu basiii kali ya.. Hahahaha. oh well.. Gotta write it down on my to-buy-product-list. Tahan sehari kok Shel, kalau di gosok-gosok aja jadi fading. Tapi di aku, overall tahan sehari. Yang lebih tahan lagi tuch Stilla Stay All Day Liquid liner. Cuman hargannya mahallll... huhuhu.. I love this Clio Kill Black eyeliner. It's not as long-lasting as I hope it would be, but you're correct that it doesn't cause raccoon eyes.